Yesterday was a special day—one we’ve anticipated with excitement! Elder Holland, one of our favorite speakers, came to the Honolulu Tabernacle and spoke to us in an afternoon missionary meeting as well as in an evening devotional. Waiting for the doors to open for the missionary meeting, all the missionaries (young and senior) greeted each other with hugs and visited in the courtyard. 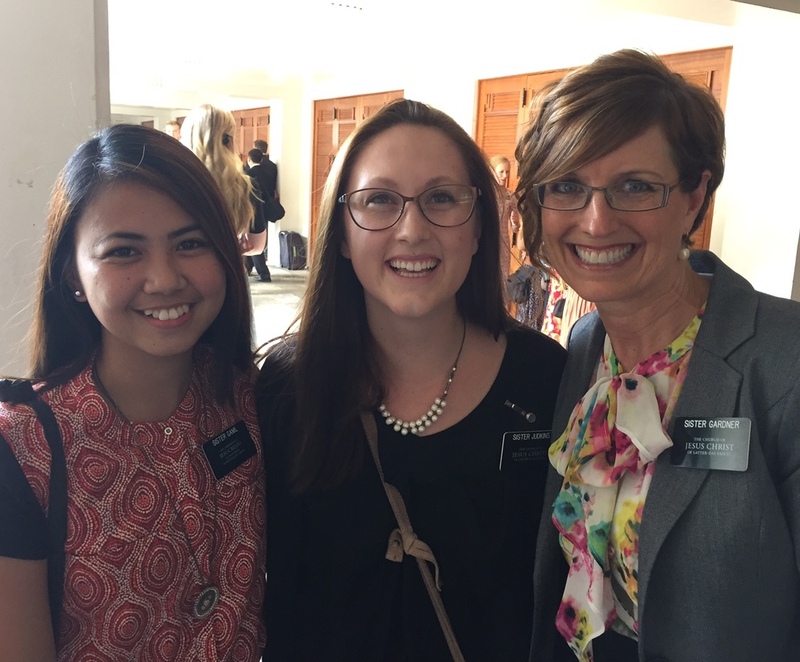 I haven’t felt like it’s appropriate to share a lot of photos of missionaries on my blog, but these are two of my favorite missionaries, and I hope they don’t mind. When we heard about the devotional, we decided to sing in the choir to be guaranteed a “good seat”. I’m kind of embarrassed to say that that was my motivation, but for those who know me, you know I’m not very musically inclined, and I was nervous. After practicing for weeks, the song was beautiful and really added to the spiritual experience of the day. In fact, Elder Gardner says we should join our ward choir when we get home to develop our lacking talent. Hmmm. I suppose he’s right. He usually is. Of the several messages he shared, Elder Holland spoke passionately about how we all matter to God, even the one, and that we need to stand up and be someone the Lord can count on to do His will. It was a powerful message and one I needed to be reminded of. He illustrated his point with stories from the Bible and the Book of Mormon as well as modern day examples. I wish you could have been there. Being taught in person by an Apostle of Jesus Christ and shaking his hand (especially watching each young missionary shake his hand and beam with delight) was truly a remarkable and humbling experience—one I hope to always remember and cherish.